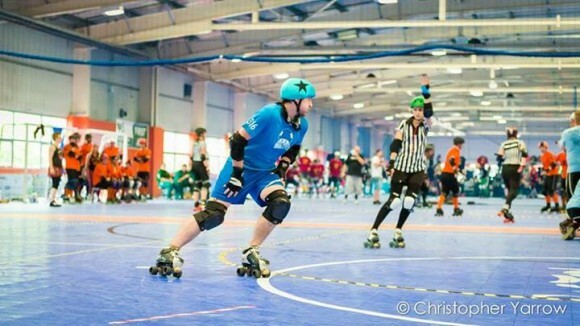 Baldie Locks from our brother team, the Super Smash Brollers, gives us his view of the Men’s European Roller Derby Championships that took place last weekend in Birmingham (organised by our head coach, Jammie Dodger!). 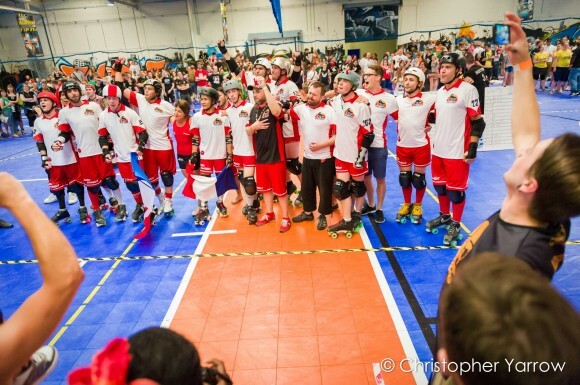 Like all the best weekends, I had no idea what to expect when I woke up on Saturday morning at 6am; bleary eyed, hung-over and only just a tiny bit regretting signing up to play in the Mens Roller Derby European Championships. For a start I’d only been skating for eight or nine months and still felt like something of a fake, stumbling around all these mostly athletic (or occasionally portly) guys who seemed to have been born on wheels. Six in the morning is not my preferred wake up time by the way; and my girlfriend, who had reluctantly agreed to come and support me, and the Nottingham Super Smash Brollers for whom I play, gave me dirty looks all the way to Birmingham for daring to wake her up. Our first bout was my second ever game. We were up against Sheffield’s Inhuman League, the same team we played in my first ever game, when they beat us with a lead of about three hundred points! We’re a new League in Nottingham, with a fair number of new members who are just cutting their teeth. What some of us lack in skills and experience, we all make up for in heart, courage and the uncanny ability to blindly throw ourselves at huge, bulky, sweaty men, travelling at suicidal speeds and knowing, even before we collide that the last thing we’re going to remember for a while is the ground. We’d spent the few weeks since that first game practicing, drilling, scrimming (and endlessly discussing tactics over a beer afterwards) so I think we gave Sheffield a bit more of a run for their money that morning. The score wasn’t quite so embarrassing anyway, and contrary to the first time round, we didn’t all spend most of our time in the sin-bin. The mob of crazies that had come along to watch and cheer us on lifted our game, especially Yoshi, Mario and Luigi, and by the end, despite the fact that we lost, we were all buzzing with adrenaline and champing at the bit for the next game. There was a bit of a wait before that though, so while my girlfriend drank some strong coffee I settled in to watch some of the best roller derby I’ve ever seen. Inhuman League vs New Wheeled Order, and Southern Discomfort vs South Wales Silures sticks out in my head as particular gems. All the teams I saw were giving 100% to their games, trying their very best to knock seven bells out of the opposition, then hugging with genuine affection and joy once the final whistle has blown. The game on this continent seems to be tipping over the edge of awesomeness. The air was electric with people realising that they’re going to be around to witness it. Our second game was against the Jakey Bites, and we thought we had a fair chance at victory. One of the Brollers is an ex-Jakey, so we had an extra reason to win, not to mention the fact that if we didn’t beat them, we wouldn’t be playing again. So we started hard, and went in harder… which in hindsight might have been a bit of a mistake. 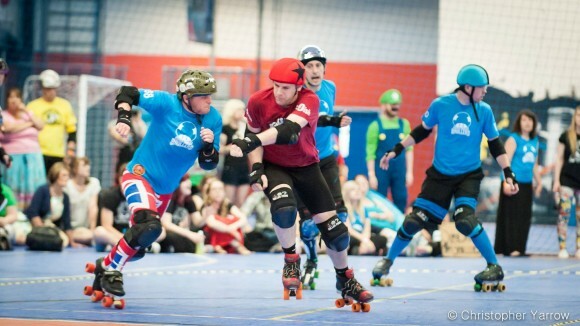 Two of our team’s bright new hopes, Skate Plissken and Bruce, jamming with an admirably ferocious lack of concern for their own wellbeing, managed to bash their knee and ribs to smithereens. Then our captain, Notts O’Gentle, lived up to his name in style, with an amazing impression of a human cannonball. I’m not sure what was more impressive, the pain of his shoulder just about popping out of joint, or the fact that he insisted in blocking in the next jam and posing for the after game photos before heading off to A&E. I guess the excitement and smell of blood got the better of us. We spent much more time in the box that second game; and gave them enough power jams to claim victory. Not to mention the fact that on the day, they played a really good game… We’ve already laid down the gauntlet for a rematch though, Charlie must be avenged! That night, I think the Super Smash Brollers were officially the last men standing (and the Brollerettes the last ladies). We rolled back to our hotel having explored the joy that is Birmingham’s night life some time before 4am. Well, the finals were being played later, and we didn’t want to be late. The next day was all about the main event. Southern Discomfort v’s Quad Guards; a grudge match to end all grudge matches, after last year’s controversial win for the London boys. 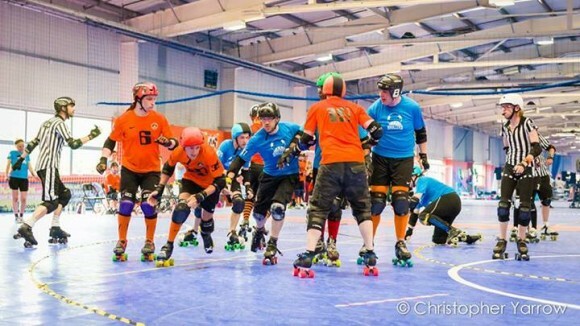 The games that led up to it didn’t disappoint however, and we were treated to a master class in roller derby excellence as the final teams found their place in the rankings. My favourite was The Inhuman League vs Tyne and Fear; each team kept swapping the lead with every jam. They were so evenly matched and determined, fighting so hard for every point. It was magic. And then the main event; London against Toulouse. I noticed my girlfriend perked up as Mr Furieux skated into the arena, followed by equally furious cheers from the audience. Rolling Stoner led his team on next, accompanied by the screams of what must have been every London derby fan. The competition on track was set to be echoed by a parallel fight between the fans for who can shout the loudest. It soon became apparent that this was a battle between Europe’s best roller derby players. Furieux and Ballistic Whistle shone out as awesome talents, both totally different in style, as Furieux slipped past blockers like a greased French pig, Ballistic spun and battered his way through wall after wall. Time and time again they jammed against each other like epic rivals from some random Greek poem. The score stayed close through the whole first half and it could have gone to anyone, the audience was on their knees, screaming themselves hoarse to outdo each other and the stage was set for the final half an hour. Five minutes in, Toulouse started to pull away past the point of no return. London handed them too many power jams, and that was that. The crown was wheezing its cheers by now, the players were all soaked with sweat as panting jammers pushed half-heartedly against exhausted blockers. If you could say one thing for certain about that game, it was that everyone gave everything they had to win it. But there could only be one winner, and as the clock counted down to the end of the competition the loudest screams from the audience could be heard with a distinctively French accent. Oh, and my girlfriend has gone out and bought a pair of roller skates. 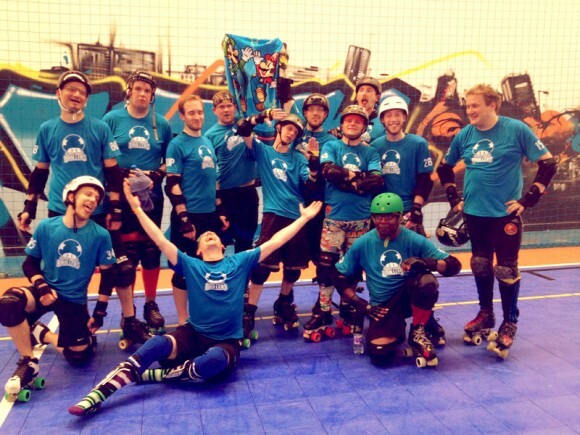 This entry was posted in Bout Reports, Events, Experiences, Roller Derby by FeartrixRotter. Bookmark the permalink.